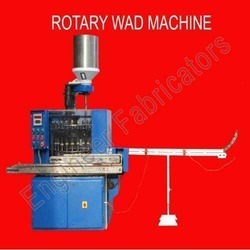 Backed with extensive industrial expertise, we are engaged in providing our clients with Rotary Wad machine, which is fabricated with high quality raw materials. Moreover, these machines are highly demanded for its high end features such as robust construction, high efficiency, durability and longer service life. Also, these machines can be availed in various customized options as per specifications detailed by clients. Additionally, we market these machines at virtually unmatched prices in market. We are the leading manufacturer and exporter of Rotary Wad Assembly machine, which is designed under the supervision of expert professionals. Further, our range of machine is highly demanded by clients worldwide as they offer high speed production. Moreover, these machines are equipped with suitable electrical, control panel, vacuum pump, inspection conveyor and mechanical hopper for wads. Our clients can avail these machines in various configurations as per their requirements. Additionally, these machines are offered at very reasonable price.